[GIDEON WELLES]. 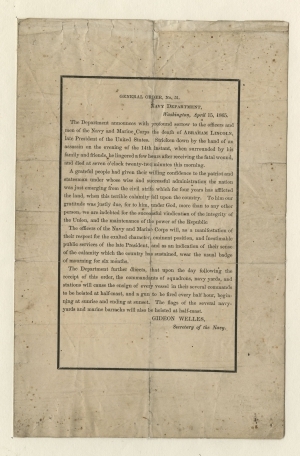 Printed Document Signed in print as Secretary of the Navy. General Order No. 51, Navy Department. Washington, D.C. April 15, 1865. Black border, issued just hours after the president’s death. One page with integral blank, 5½ x 8½ in. Navy Department /Washington, April 15, 1865. The Department announces with profound sorrow to the officers and men of the Navy and Marine Corps the death of ABRAHAM LINCOLN, late President of the United States. Stricken down by the hand of an assassin on the evening of the 14th instant, when surrounded by his family and friends, he lingered a few hours after receiving the fatal wound, and died at seven o’clock twenty-two minutes this morning. A grateful people had given their willing confidence to the patriot and statesman under whose wise and successful administration the nation was just emerging from the civil strife which for four years has afflicted the land, when this terrible calamity fell upon the country. To him our gratitude was justly due, for to him, under God, more than to any other person, we are indebted for the successful vindication of the integrity of the Union and the maintenance of the power of the Republic. The officers of the Navy and Marine Corps will, as a manifestation of their respect for the exalted character, eminent position, and inestimable public services of the late President, and as an indication of their sense of the calamity which the county has sustained, wear the usual badge of mourning for six months. The Department further directs, that upon the day following the receipt of this order, the commandants of squadrons, navy yards, and stations will cause the ensign of every vessel in their several commands to be hoisted at half-mast, and a gun to be fired every half hour, beginning at sunrise and ending at sunset. The flags of the several navy-yards and marine barracks will also be hoisted at half-mast. Parke-Bernet Galleries, (unknown sale date) lot 287. Affixed along left edge to backing sheet. Separation and minor spots of paper loss along the folds repaired with archival tissue. Small pinholes at corners. Some toning and foxing.